Thousands of shivering, tired residents got out while they could, and others prayed that miles of sandbagged levees would hold Friday, as the surging Red River threatened to unleash the biggest flood North Dakota's largest city has ever seen. "It's to the point now where I think we've done everything we can," said resident Dave Davis, whose neighborhood was filled with backhoes and tractors building an earthen levee. "The only thing now is divine intervention." The Red River marked a historic high of 41 feet on Friday and the water is expected to crest on Sunday at between 42 and 43 feet, nearly 3 feet higher than the record set 112 years ago. Evacuations are accelerating on both sides of the river, reports CBS News meteorologist Dave Price. Residents left nursing homes, patients removed to other hospitals and homeowners are clearing out. "Yeah, we're packing up, loading the car, grabbing the cats and going," said Sarah Soltz of Moorhead, Minn.
Others have chosen to take a stand. One resident of Moorehead said, "I don't see any reason to give up until you have to. Until you see water coming into your house, you keep fighting." Some have already lost the battle. There have been nearly 100 Coast Guard rescues in the last few days. Temperatures now are expected to rise above freezing this weekend, providing relief from the bitter cold. But with the thaw comes a fresh peril - melting ice, complicates predictions about how much water the dikes must withstand. National Guard troops fanned out in the bitter cold to inspect floodwalls for leaks and weak spots, and residents piled sandbags on top of 12 miles of snow-covered dikes. The freezing weather froze the bags solid, turning them into what residents hoped would be a watertight barrier. The river swelled Friday to 40.67 feet - more than 22 feet above flood stage and beyond the previous high-water mark of 40.1 feet in 1897. In one flooded neighborhood, a man paddled a canoe through ice floes and swirling currents. Fargo Mayor Dennis Walaker cautiously expressed hope that the river would stay below 43 feet - the limit of the reinforced dikes. Walaker said there was not enough time to build the levees any higher. "I think the river is mad that she lost the last time," said engineer Mike Buerkley, managing a smile through his dark stubble as he tossed sandbags onto his pickup truck after working 29 straight hours. In a flood-stricken small town north of Fargo, a fire burned down a house that was so surrounded by floodwaters that firefighters couldn't get within 200 feet. Giant flames ate a huge gash through the roof as black smoke soared into the sky, all while a line of sandbags surrounded the base of the home in Oakport Township. It wasn't known what caused the fire. Some 1,700 National Guard troops helped reinforce the dikes and conduct patrols for leaks. Police restricted traffic to allow trucks laden with sandbags, backhoes and other heavy equipment to get through. Guard member Shawna Cale, 25, worked through the night on a dike, handing up sandbags that were 30 to 40 pounds and frozen-solid. "It's like throwing a frozen turkey," said sister-in-law Tawny Cale, who came with her husband to help with the sandbags and then to help Shawna move her valuables as she evacuated. "When it hurts when you lift your arms, you have to stop," Shawna Cale said. City Administrator Pat Zavoral said the cold firms up the bags, strengthening the dikes. "If you lay loose bags and now they're frozen, they're like a frozen ice cube. It's good shape." Authorities said they were keeping about 300,000 of the 3 million sandbags they had Friday in warm buildings for use as needed. Sandbags that are already frozen when piled onto a dike do not fit together snugly. But the freezing temperatures actually helped stave off worse flooding; officials said the river was rising more slowly because the freezing temperatures prevented snow from melting. The White House said it was monitoring flooding in North Dakota and Minnesota, and President Barack Obama has dispatched the acting head of the Federal Emergency Management Agency to the region. White House spokesman Robert Gibbs said Obama has personally spoken with the governors of both states and with Fargo's mayor. The president called North Dakota Sen. Kent Conrad on his cell phone during a news conference in Bismarck on flooding problems there and in Fargo. "If there's anything more that we can do, we will do it," Obama said after Conrad held the phone up to a microphone. 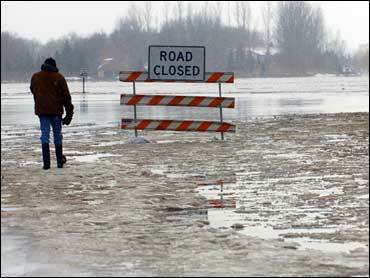 Authorities in Fargo and across the river in Moorhead - a city of about 30,000 people - expanded evacuations Friday across several blocks. About 2,600 households in Moorhead - about a third of the city - were asked to leave their homes. Hundreds more in Fargo were asked to evacuate. In a tiny town south of Fargo, Lowell Bottrell paddled through floodwaters with a canoe to ferry sandbags, generators and pumps between homes, encountering vicious currents, giant ice floes and water that nearly topped some signs. To keep warm, he wore a "Go Bison" stocking cap, paying tribute to Fargo's beloved sports team at North Dakota State University. Some residents were roused from their sleep around 2 a.m. Friday and told to leave after authorities found a leak in a dike. They expected to be able to patch it securely. More than 100 inmates were taken from the county jail in Fargo to other lockups in the region, and Moorhead planned to evacuate the police station because of encroaching floodwaters. Sen. Byron Dorgan said Northwest Airlines was sending two jetliners to move hospital patients to safer areas. The effort to fortify flood-prone neighborhoods took place around the city, with officials building a contingency dike system as a second line of defense should the river breach riverside neighborhoods. But some residents were left between the two sets of dikes. "There are people who are angry about being on the wrong side of the dike," said Tim Mahoney, a Fargo city commissioner whose home is in one of the "wrong-side" neighborhoods. "We have a 500-year flood that we're combatting, and we think we're doing as well as we can," Mahoney said. Residents in another of those neighborhoods placed pumps in their yards in hopes of keeping water out of their homes. Tina Kraft took everything of value or importance in her basement and first floor and moved it upstairs. "We've prepared for it as best we can," she said. "We really just have to be ready for our house to be flooded." Deanne Mason and her husband were awakened by the sound of backhoes and tractors building the backup dike. "I'm not so worried about losing my house," she said. "It's just stuff. But it's emotionally draining to watch this."